Acute lymphoblastic leukemia (ALL) is the most common malignancy of childhood. Central nervous system is the most frequent place of both at the onset and relapse of the disease, but orbital involvement is rarely seen. A seven-year-old girl diagnosed with high risk ALL and Turkish ALL-Berlin Frankfurt Münster (BFM)-2000 high risk group treatment was given. However, after induction and consolidation treatments, before the maintenance treatment she had blindness in her right eye. Ophthalmologic examination her visual acuity was fingers to count in two meters. In her right eye there was exudative retinal detachment and her orbital magnetic resonance imaging (MRI) showed that, there was a mass lesion in the posterior of right orbital globe, on the neighbourhood of optic disc, consistent with metastasis. After ALL-REZ-BFM-2002 relapse protocol treatments and radiotherapy her visual acuity was increased to 6/10. In control orbital MRI regression of mass lesion size was established. Bone marrow transplantation was planned. Orbital involvement is rarely seen in leukemia, but it is responsive to chemotherapy and radiotherapy combination. Acute lymphoblastic leukemia (ALL) is the most common malignancy of childhood, which could be curable in 80% with intensive chemotherapy protocols (1). Central nervous system is the most frequent place of both at the onset and relapse of the disease (2). Orbital involvement is rarely seen. In literature, with 25 isolated orbital relapse case series it is indicated that isolated relapse cases were treated successfully with chemotherapy and radiotherapy combination (3). We report a high risk ALL case with isolated orbital relapse that was treated with Turkish ALL-Berlin Frankfurt Münster (TRALL-BFM)-2000 protocol. A seven-year-old girl administered to our clinic with the symptoms of fever and abdominal pain. In her physical examination, there were widespread lymphadenopathy, gingival hypertrophy, hepatomegaly with 6 cm and splenomegaly with 5 cm. Laboratory results were as follow; hemoglobin: 6.5 g/dL, platelet: 139 K/UL, white blood cell count: 611 K/UL, lactate dehydrogenase: 1961 U/L, uric acid: 13.6 mg/dL. There was L1 type lymphoblast in peripheral smear 98% and in bone marrow aspiration 85%. With flow-cytometry results, she was diagnosed with pre B cell ALL. BCR/ABL fusion was detected in cytogenetic analysis. She was diagnosed with high-risk group due to high white blood cell count and Philadelphia chromosome positivity. TRALL-BFM-2000 high risk group treatment was started. There was not any lymphoblast in her cerebrospinal fluid (CSF). After induction and consolidation treatments, before the maintenance treatment blindness developed in her right eye. Ophthalmologic examination her visual acuity was fingers to count in two meters. In her right eye there was exudative retinal detachment and metastatic lesion around optic nerve. Bilaterally intraocular pressure and ophthalmologic examination of left eye were normal (Figure 1). Cranial magnetic resonance imagining (MRI) was normal, but orbital MRI showed that there was a mass lesion in the posterior of right orbital globe, on the neighbourhood of optic disc with dimensions of 6x1 cm consistent with metastasis. Her CSF and bone marrow aspiration, which were done for relapse, were normal. Biopsy could not be performed from mass lesion. Patient age and primary sickness were considered and diagnosed as ALL relapse. After ALL-REZ-BFM-2002 relapse protocol F1, F2 and R2 block treatments; radiotherapy and bone marrow transplantation from unrelated donor was planned. At the end of R2 block chemotherapy, her visual acuity was increased to 6/10 and in her ophthalmologic examination decrease in retinal detachment was detected. In control orbital MRI regression of mass lesion size was established. Informed consent was taken from patient family. In ALL patients, like our case, hyperleukocytosis at administration, Philadelphia chromosome positivity show poor prognosis. The most frequent extramedullary involvement is seen in central nervous system (2). Orbital involvement is rarely seen in leukemia patients. In differential diagnosis of exudative detachment there are uveal fusion syndrome, choroidopathy, Harada syndrome, choroid detachment, choroidal neovascularisation, and severe intraocular hypotonic but with consideration of patients age and primary illness it was thought with orbital relapse. In ALL patients who were in remission period, 25 isolated case series were reported. In the 10 of patients were on treatment, 15 of patients after completion of treatment. They administered with orbital symptoms. Their age was between 1 to 13. An average of 29 months after diagnosis, ocular relapse was detected, and long-term survival was long in the group who took both chemotherapy and radiotherapy. In one patient who took low dose local radiotherapy, resistance of leukemic cells was developed, and enucleation was performed. In this case series, it was reported that with local radiotherapy and systemic chemotherapy treatment was successfully achieved. Also, after treatment prognosis was reports as better in isolated orbital relapse group than central nervous system and bone marrow relapse groups (3). First case with isolates orbital ALL relapse administered with unilaterally retinal detachment and unresponsive to medical treatment painful glaucoma. Patient was treated successfully with systemic and intrathecal chemotherapy (4). A 17-year-old patient, who was followed as leukemia, administered with retinal detachment and choroidal haemorrhage. Patient was treated with prednisolone, topical steroid and atropine but while when she administered her CSF and bone marrow was clean, after five months bone marrow relapse was seen (5). In our country, Azık et al. 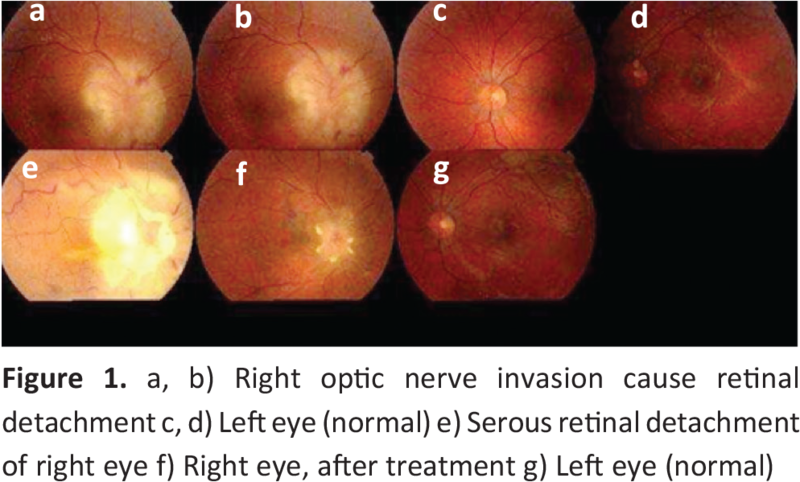 (6) reported an eight-year-old ALL patient, who had sudden visual loss in remission period. In this case there was also isolated orbital relapse was detected without bone marrow and central nervous system relapse. Retinal detachment resulted with sudden visual loss (6). Our case was high risk ALL patient and isolated orbital relapse was seen. From 10 months of diagnosis, orbital involvement was seen. After systemic chemotherapy leukemic infiltration and retinal detachment decreased. As a result, orbital involvement is rarely seen in leukemia, but it is responsive to chemotherapy and radiotherapy combination. Leukemia patients, especially high-risk ones, should be screened with ophthalmologic examinations both at diagnosis and after treatment. Informed Consent: Informed consent was taken from patient family. Surgical and Medical Practices: A.P., Concept: S.A., Design: Y.I.B., Data Collection or Processing: A.K., Analysis or Interpretation: H.E., Literature Search: F.Ö.A., Writing: F.Ö.A. Pieters R, Caroll WL. Biology and treatment of acute lymphoblastic leukemia. Pediatr Clin North Am 2008;55: 1-20. Cancela CS, Murao M, Viana MB, de Oliveira BM. Incidence and risk factors for central nervous system relapse in children and adolescents with acute lymphoblastic leukemia. Rey Bras Hematol Hemoter 2012; 34: 436-41. Curto ML, D'Angelo P, Jankovic M, Fugardi MG, Ziino O, Casale F. Isolated ocular relapse in childhood acute lymphoblastic leukemia during continuing complete remission. Haematologica 1996; 81: 47-50. Primack JD, Smith ME, Tychsen L. Retinal detachment in a child as the first sign of leukemic relapse: histopathology, MRI findings, treatment, and tumor-free follow up. J Pediatr Ophthalmol Strabismus 1995; 32: 253-6. Schmiegelow K, Scherfig E, Prause JU, Jensen OA. Isolated leukemic choroidal relapse in a child with acute lymphoblastic leukemia one year off therapy, diagnosed through transvitreal retino-choroidal biopsy. Acta Ophthalmol (Copenh) 1988; 66: 33-7. Azık FM, Akıncı A, Saylı TR, Culha VK, Teberik K, Teke MY, et al. Unilateral exudative retinal detachment as the sole presentation of relapsing acute lymphoblastic leukemia. Turk J Hematol 2012; 29: 181-4.